Europe has taken pride in showing global leadership on decarbonisation. But the European approach is over reliant on renewable generation. Success of the European decarbonisation agenda has become increasingly tied to the success of renewable policy implementation. 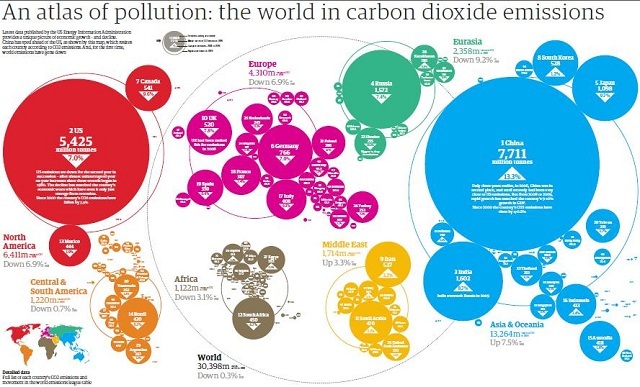 This dependence threatens to undermine progress on decarbonisation altogether. This would be a big mistake given the penetration of renewable energy in Europe will have only a marginal impact on global carbon emissions. The decarbonisation debate in Europe has become increasingly narrowly focused on a polarised conflict over support for renewable generation. Subsidies for wind, solar and biomass capacity have been the mainstay of the EU’s push to decarbonise. But popular support for this approach is under threat against a backdrop of tightening austerity measures and rising energy bills. In addition the side effects of renewable capacity subsidies, such as transmission system stress and price cannibalisation, are causing headaches across the energy industry. Europe has taken pride in showing global leadership on decarbonisation. But the European approach is over reliant on renewable generation. Success of the European decarbonisation agenda has become increasingly tied to the success of renewable policy implementation. This dependence threatens to undermine progress on decarbonisation altogether. 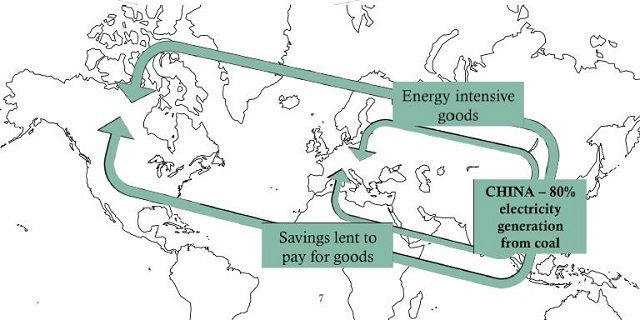 This would be a big mistake given the penetration of renewable energy in Europe will have only a marginal impact on global carbon emissions as illustrated in Diagram 1. The irony of the European policy agenda is that it does virtually nothing to address the outsourcing of industrial emissions to developing economies in Asia. This is a problem that stems from focusing only on measuring domestic emissions rather than the full emissions ‘lifecycle’. We may be using more wind energy to power our dishwashers, but our dishwashers (flat screen TVs, computers etc…) are being built in a Chinese factory that is running on coal fired power. This issue has become a key theme of Dieter Helm of Oxford University and is simply illustrated in Diagram 2. Global growth over the last two decades has been driven by developed economy import consumption of energy intensive goods from Asian exporters, specifically China. Emissions measurement within the power sector also lacks consistency. Focusing only on emissions from power plant combustion is misleading as it ignores emissions produced over the fuel ‘life-cycle’ including extraction, processing and transportation. For example the inclusion of emissions associated with LNG liquefaction and transportation can materially increase the emissions intensity of gas-fired power. This issue is much worse for combustion of oil sourced from the highly carbon intensive tar sands extraction process. Energy efficiency: the most cost effective way to reduce emissions has become bogged down in bureaucracy is most EU countries. Scandinavia has set a strong example and is a decade ahead of most other European countries. Demand side response: For all the talk of smarter energy, much more could be done at a policy level to improve incentives and technology rollout to enable energy consumers to respond to market price signals. Nuclear: It may be politically unpopular after Fukushima but nuclear remains the only scalable and proven low carbon baseload generation technology. China understands this and is pursuing its own nuclear programme but with little leadership from developed countries. The early closure of existing nuclear plant is only resulting in more fossil fuel burn. Nuclear plant is a lesser of two evils. Gas plant life extensions: It makes little sense from either a cost or carbon perspective to build a new gas plant with a 20-30 year lifespan if the life of an existing plant can be extended instead. But life extensions need the support of a policy framework that can ensure adequate returns for lower load factor plant. CCS: As a technology CCS may or may not become commercially viable. But there is an inconsistency between the current lack of policy support for CCS and the role it is assumed to play in achieving 2050 decarbonisation targets. Price signals and emissions measurement: To address the problem summarised in Diagram 2, a clearer carbon price signal to consumers and a shift towards measuring carbon emissions on a full life-cycle basis is required. This is challenging both politically and administratively, but offers the most potential to make a meaningful impact on global emissions. How far will the UK fall short of its renewable generation target?